Risotto has got to be one of the ultimate comfort food. It’s cheesey, creamy, oozy and has a deliciously comforting velvety texture. 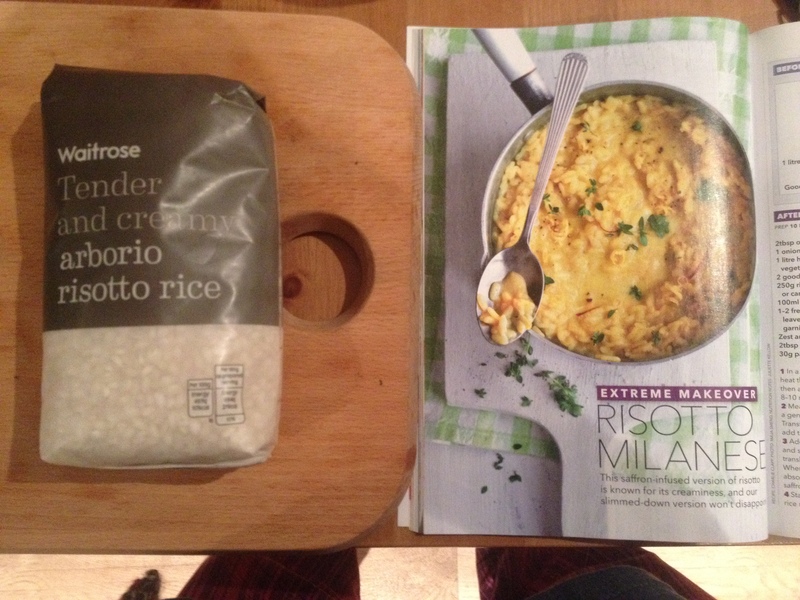 Risotto alla Milanese translates as risotto with saffron – and ingredient I’ve not had much time to use as a student! But I finally got my hands on some this week and this was the first recipe on my mind! Risotto is a dish originally from northern Italy consisting of rice cooked with stock until its a creamy consistency. I used the traditional risotto rice, which is known as Arborio, but you could substitute it was white short grain rice if that’s all you have! Both of these types of rice love to take in the moisture from the pan and let out the starch they contain making your risotto nice and creamy! I heard about this particular recipe when it was featured in Healthy Food Magazine but I altered it a bit from their recipe so I’ll post mine below so you can see what I did! 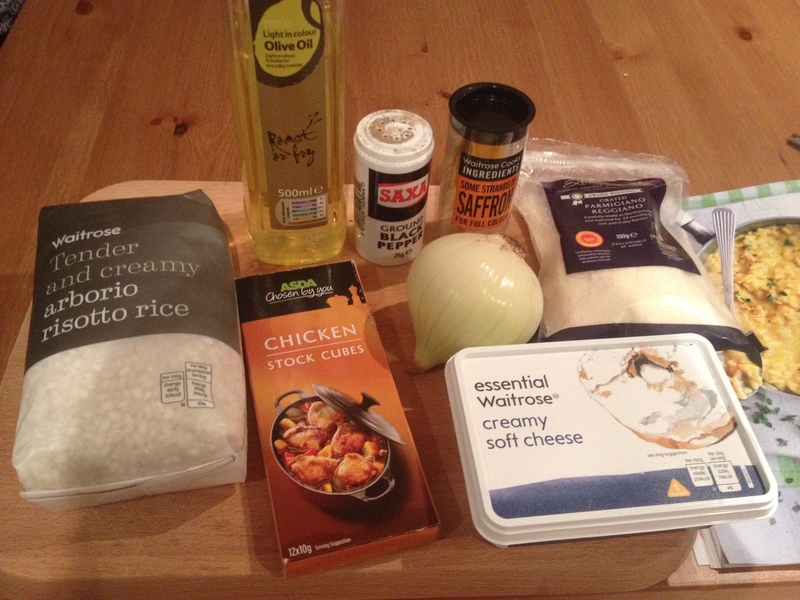 There’s a few ingredients to this, and so many people find risotto difficult to cook. I think it’s because you really need to keep stirring it to stop it sticking and to release the starch – but honestly keep an eye on it, keep up that stirring – and you’ll be fine! 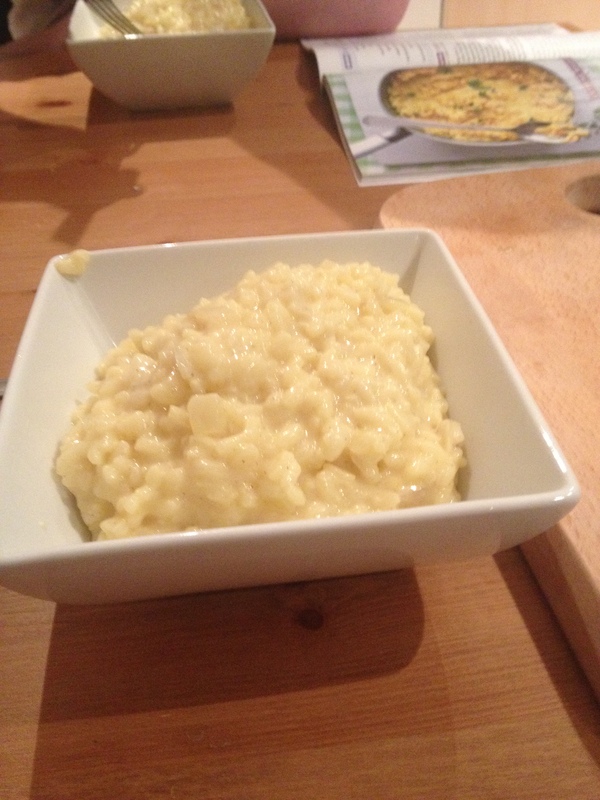 Traditionally in Risotto the rice is first cooked with the onions in the pan with a little olive oil. This gets each grain of rice coated in the olive oil and this process is known as tostatura. It’s after this we add the stock and saffron and then later when it’s all cooked – the cheese! 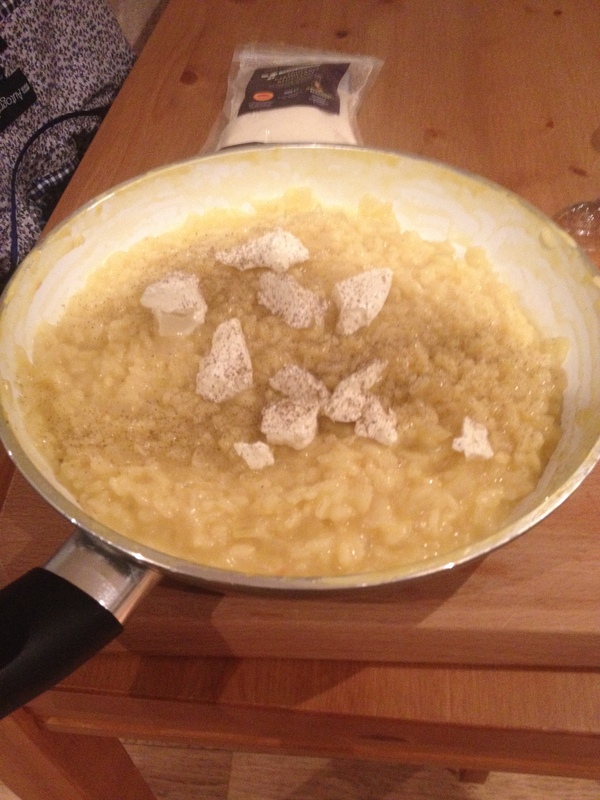 Parmesan is a pretty common ingredient to find in a risotto – but soft cheese? Not so much! It works really well though and gives it a lovely creamy texture – and if you use the low fat version it’ll be better for your waistline too. You would use about 75g of Parmesan in an ordinary risotto alla milanese but in this healthier version they’re cut that by half and added two table spoons of soft cheese instead. I know, I know, my risotto looks very pale and there are no lovely sprigs of herbs or anything – but I bought the saffron this week so herbs were a no go on my budget! It was still delicious even if it does look a bit pants in my photos! 1. In a large pan, on a medium heat, start to cook the onions in the oil. We are just starting the cooking process in this step. 2. When the onions begin to go translucent, add in the rice straight to the pan. No need to add water or liquid to the rice at this stage, we want to get each grain of rice coated in the oil and that yummy onion flavour! Cook like this for 10 minutes making sure the ingredients do not catch or stick to the bottom. 3. Make up the vegetable/chicken stock with boiling water and separate a little dribble (about 3t tablespoons-ish) into a small bowl. To the small bowl of stock add a good pinch of saffron and leave it to soak for a few minutes until the yellow color has leaked out of the saffron. This can then be added to your rice/onion mix and should be quickly absorbed by the rice. 4. Next, take one ladle-ful of the stock and add it to the frying pan. Stir it up and keep stirring until the liquid has been absorbed by the rice and the mixture goes back to it’s stickier, stodgy consistency. Repeat this step, one ladle of stock at a time, until you have no more stock left to add! 5. Once you’ve finally added all that stock (it should take about 20-25 mins), you’re rice should be cooked. It shouldn’t break down too much and should be al dente and have a bit of bite. If there’s lots of liquid left you need to keep cooking and keep stirring so the rice releases it’s starch and thickens it up. 6. When it’s all ready, add in the cream cheese, a pinch of salt and two pinches of pepper. Stir it all in and then add in the Parmesan. It should come to a creamy, oozy consistency. YUM!